A new cruise complex has been constructed at the foot of the pier called Tortola Pier Park. It is 80,000 square feet and in addition to an administration building there are 50 shops and restaurants. There is also a place for land-tours to assemble and a separate pier for boat tours. It is only a short walk to town. Road Town, the Capital of the British Virgin Islands, surrounds the harbor like an amphitheater, its buildings stretching up into the hillsides in search of scarce land. 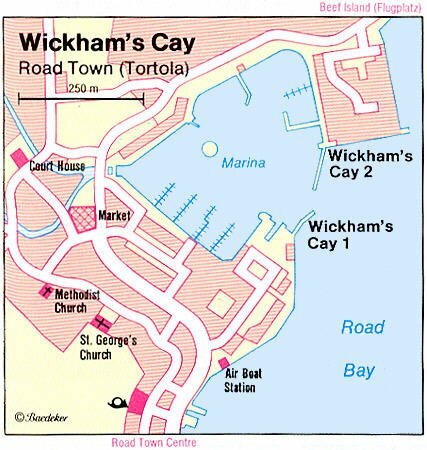 The spacious, beautiful harbor at Road Town is a busy center of island life and marine activity in this tropical archipelago. Businesses, government, restaurants, hotels, charter boats, cruise ships, shops--all are here in Road Town. Beneath its placid tropical exterior, Road Town is very much an international city, at the crossroads of a continuing Caribbean maritime culture of upscale tourism and offshore finance. About 80% of the BVIs’ 23,500 citizens live and work on Tortola. In the heart of Main St, the stark whiterubble walls of HM Prison date back to the 18th century. The fortress is still a working jail. Another way to see the island is to organize a readily available taxi 'tour'. Taxis are abundant on Tortola, and so long as you use a legitimate taxi association driver prices will generally allow you to travel anywhere you wish but for less than the cost of renting a car. Always ensure that you thoroughly confirm the fare charge before you get into the taxi. Secluded palm-shaded beaches at Apple Bay, Brewer's Bay, Elizabeth Beach, Josiah's Bay Beach, Long Bay Beach and Smuggler's Cove make for excellent swimming and snorkeling. There are also many well-equipped facilities for fishing, snorkeling, scuba diving and more. Plenty of ferries are near the cruise dock, making it easy to visit the other "Virgins". i.e The Baths on Virgin Gorda, also part of the British Virgin Islands. Trip takes about 25 minutes. A long and lovely curved bay that’s sheltered from heavy winds, Cane Garden Bay on Tortola’s north shore is a favored anchorage for boaters. Swimming, windsurfing and other water sports attract tourists and BVI residents alike, who also enjoy the lively bars and restaurants that line the beach. Cruise ship visitors, who want to stretch their "shopping" legs on land, can browse on the cay at the shops on Wickham's Cay. The best location for shopping is across at quaint Main Street. Head toward the nearest hillsides across Waterfront Drive. Crafts Alive Marketplace: A collection of gaily colored tents, on the Waterfront; while it sells some of the same batiks and tourist trinkets of marketplaces on other Caribbean islands, there are a handful of genuinely interesting stalls.